This presentation is about a real-life mystery. It concerns numerical patterns of eight found in the name "Jesus Christ" as it was originally written in the New Testament Greek. 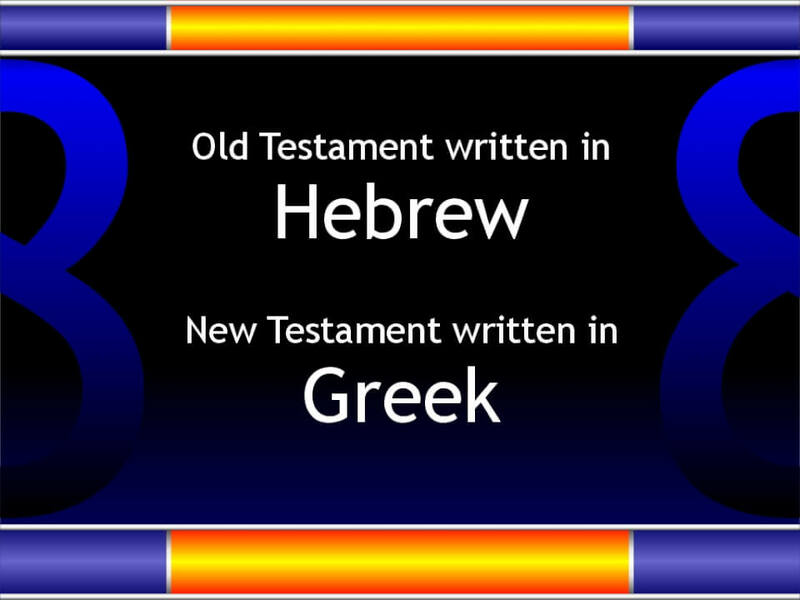 Greek was the original language of the New Testament. 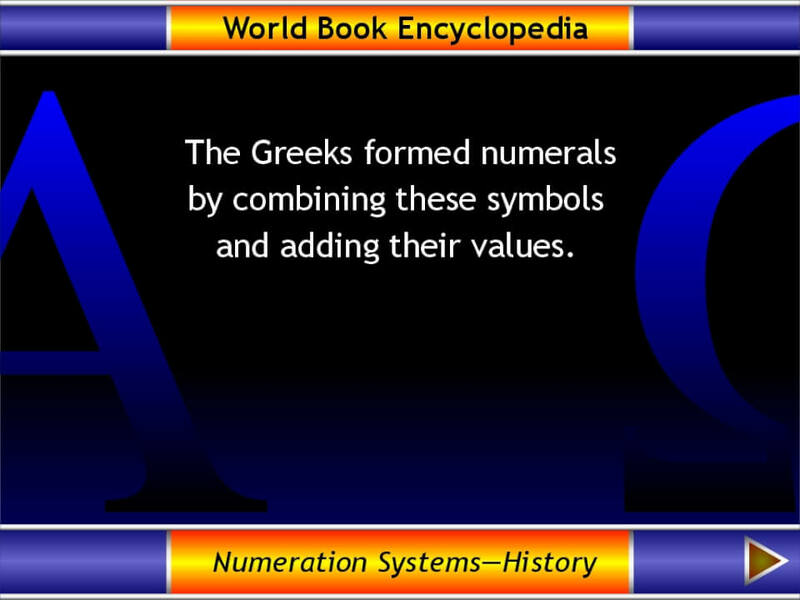 The ancient Greeks assigned numeric values to the letters of their alphabet. For two thousand years this fact has been associated with proposed solutions to the biblical riddle of the "number of the Beast". 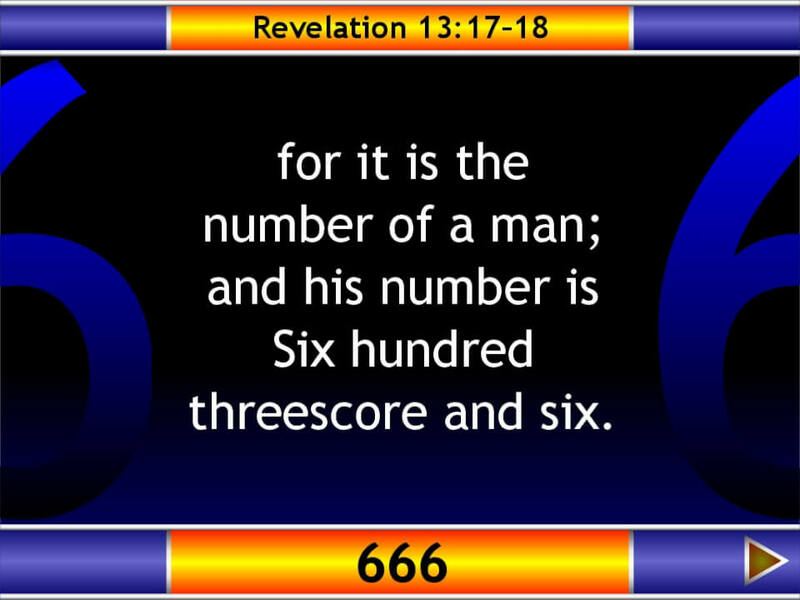 The book of Revelation speaks of the "number of the Beast", or the "number of his name" being 666. The number 666 has become well-known as an evil symbol, the number of antichrist. 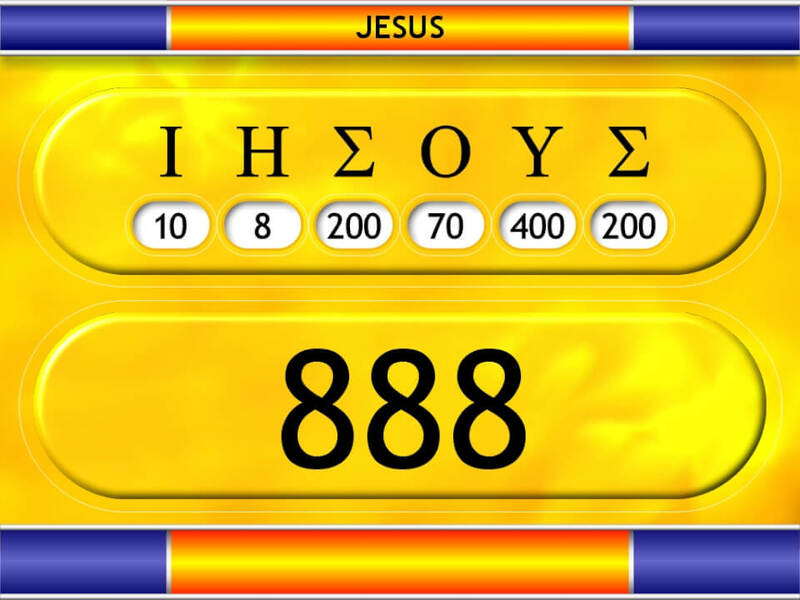 What is not so well known is a similar number connected with the name of Christ. 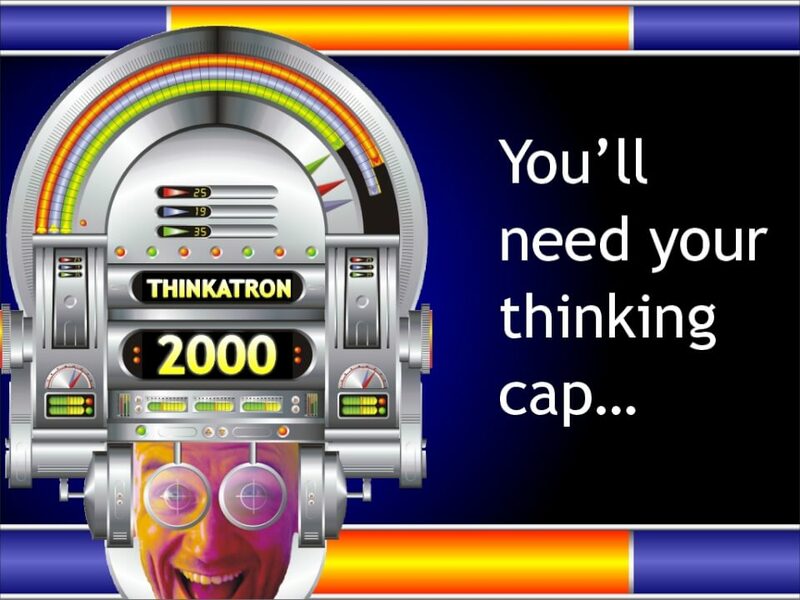 This presentation will require a little bit of concentration, so be prepared to take your time! Let's get some background with a brief look at the riddle of the "beast" in Revelation. 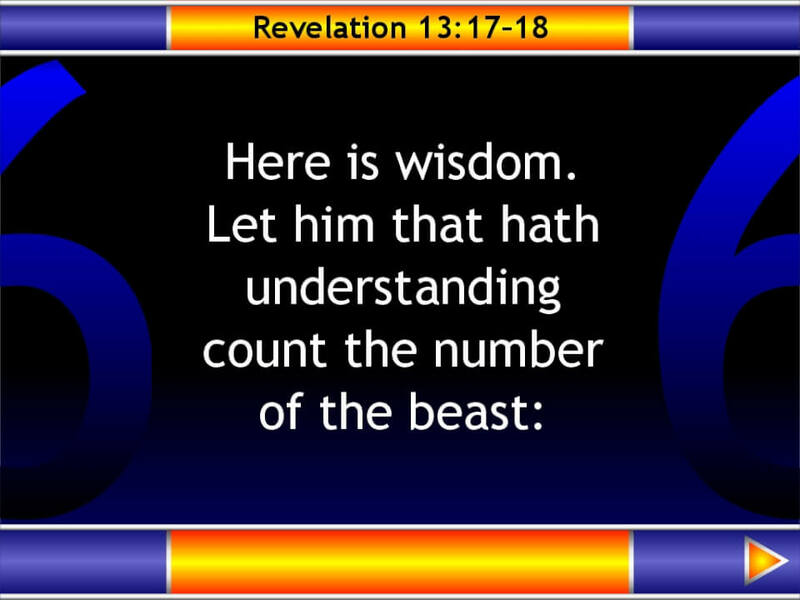 Counting or calculating the "number of the beast" or the "number of his name" requires some understanding. The value of 666 is somehow associated with the number of his name. How was this to be calculated? 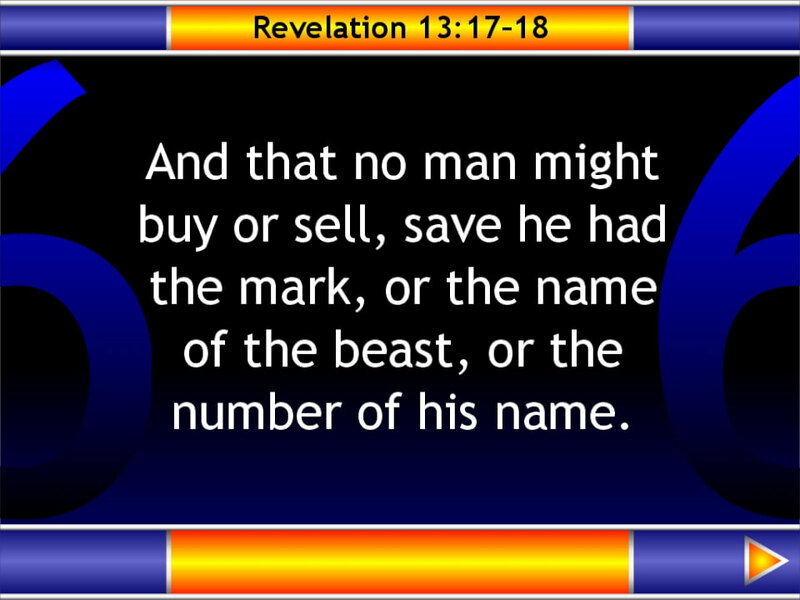 The book of Revelation in which the riddle of the beast's name is recorded was written in Greek, as was the rest of the New Testament. 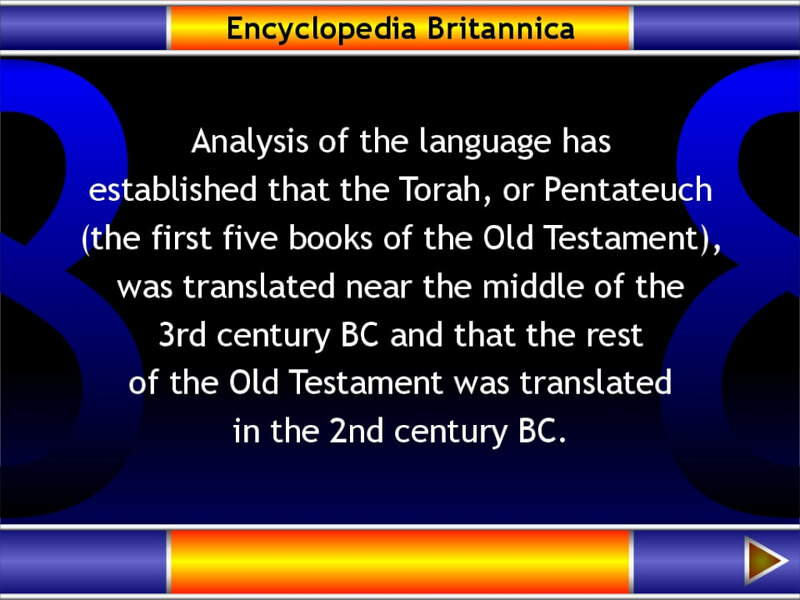 The Old Testament was written in Hebrew. 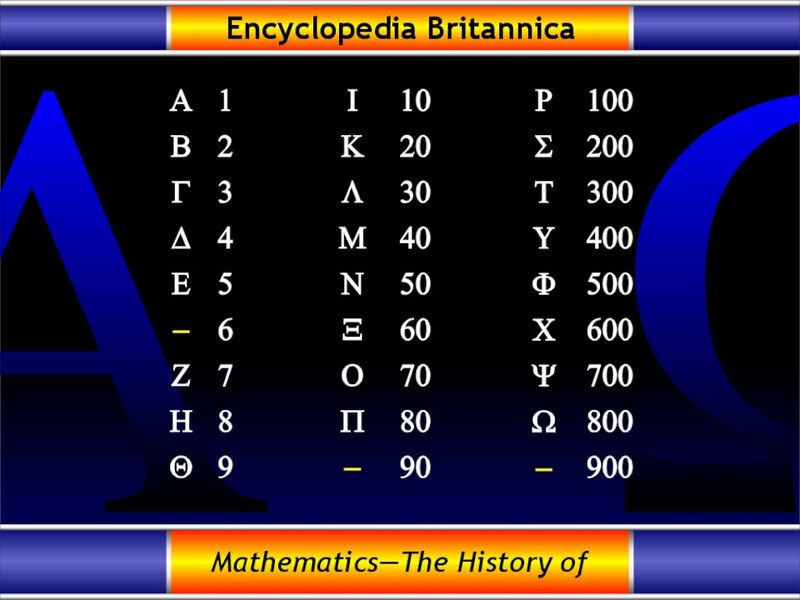 Both these languages used the letters of their alphabets to represent numerical values as well as letters, in much the same way as the Romans assigned values to some of their own letters (and which we know as Roman numerals). 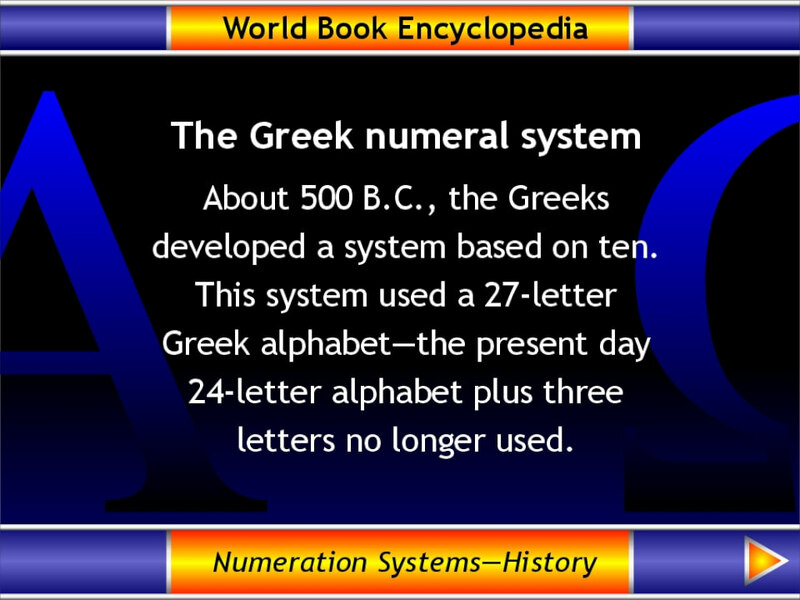 The Greeks developed their system long before the writing of the New Testament. 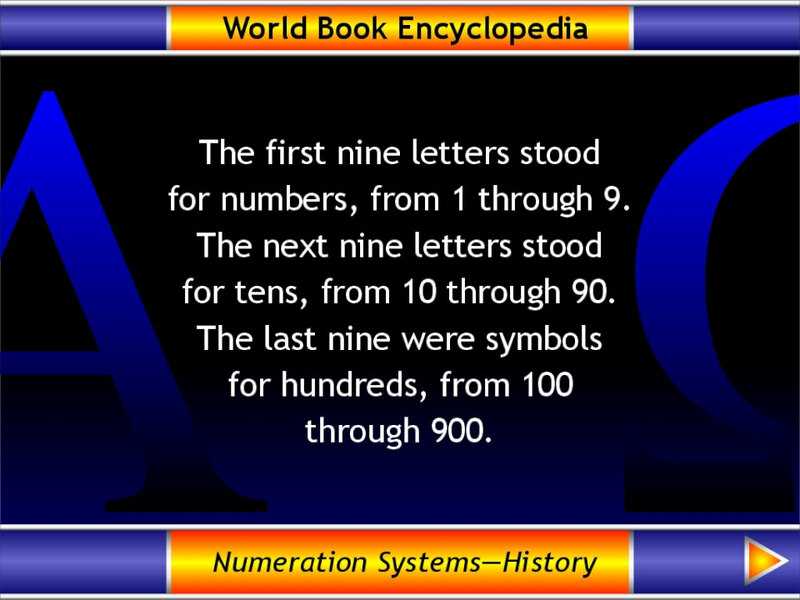 Again, in much the same way as Roman numerals, letters were combined to produce larger numbers. 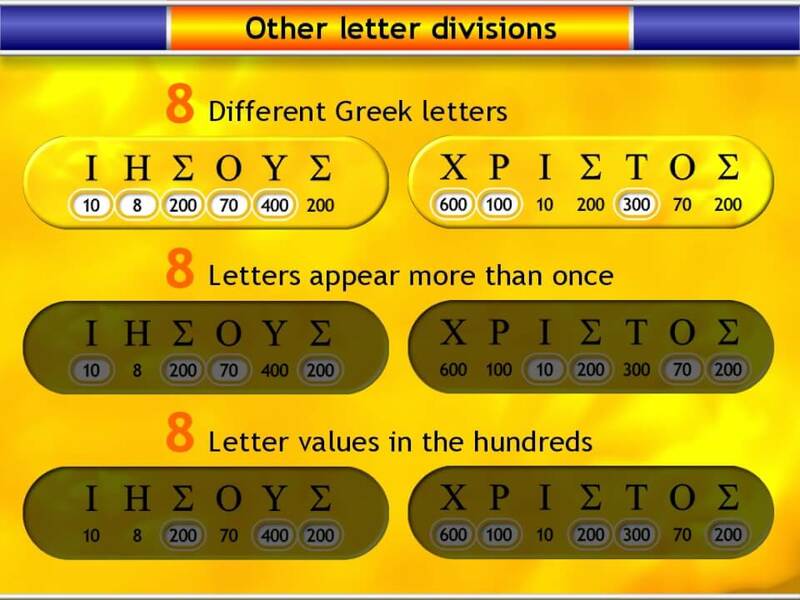 This list shows the Greek letters (which in ancient times were all uppercase) and their values. 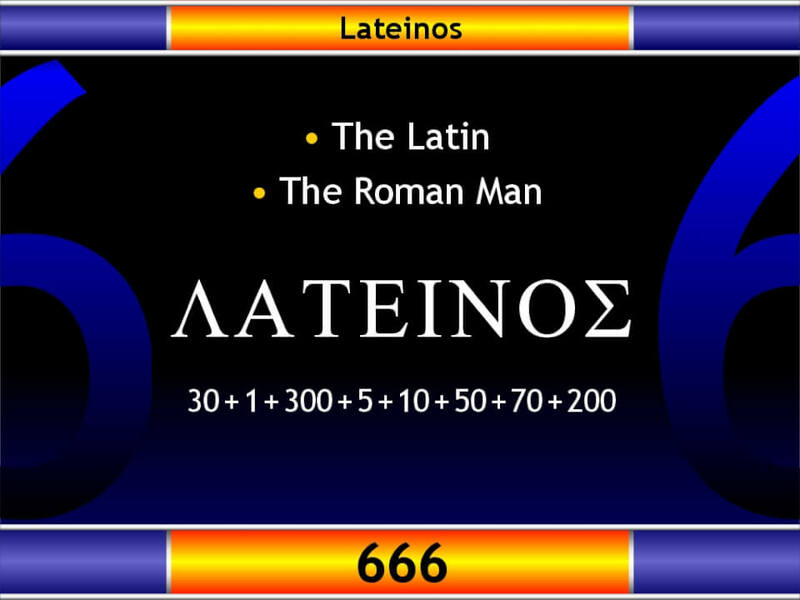 One of the best known of the ancient solutions to the riddle of the number of the beast was the value of the Greek word "Lateinos", meaning the "The Latin" or "The Roman man". The values of each of the letters in this word when added together total 666. Among some of the personal names that have been suggested in history as answering the riddle is a name that has been taken by a number of popes. 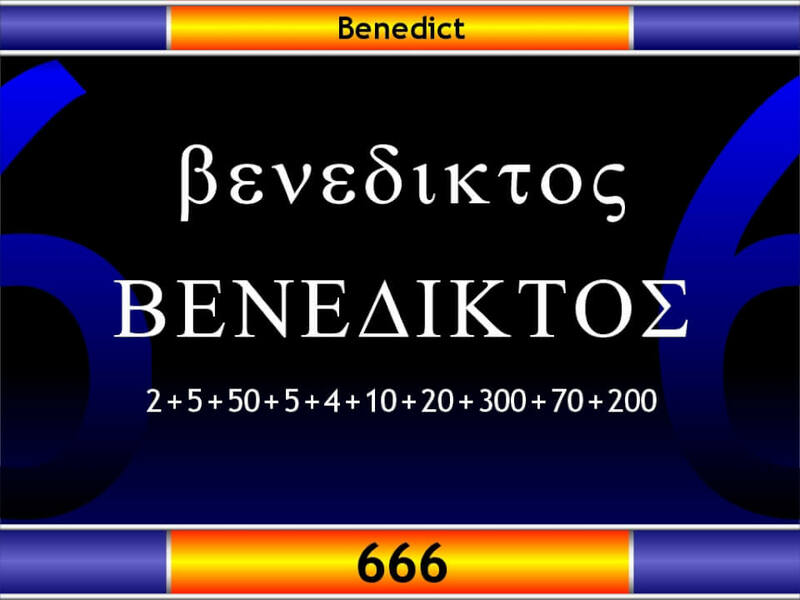 Benedict in the Greek is Benediktos and totals 666. (Source: Horae Apocalypticae, E.B. Elliott 5th Edition, 1862.) One of the most recent Popes was named Benedict. Most unfortunate for him! 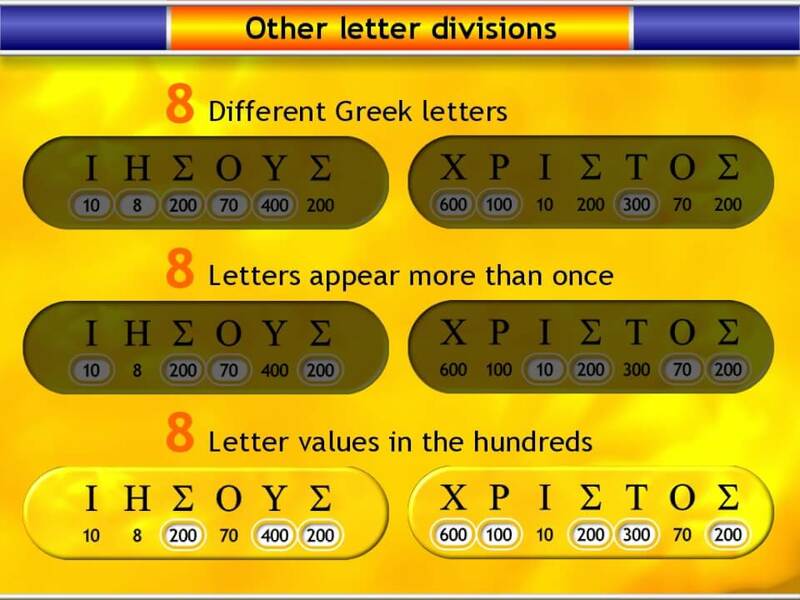 The use of letters to represent both letters and numbers led to the ancients playing number games with their words. Some instances of this have been recorded on the walls of Pompeii. 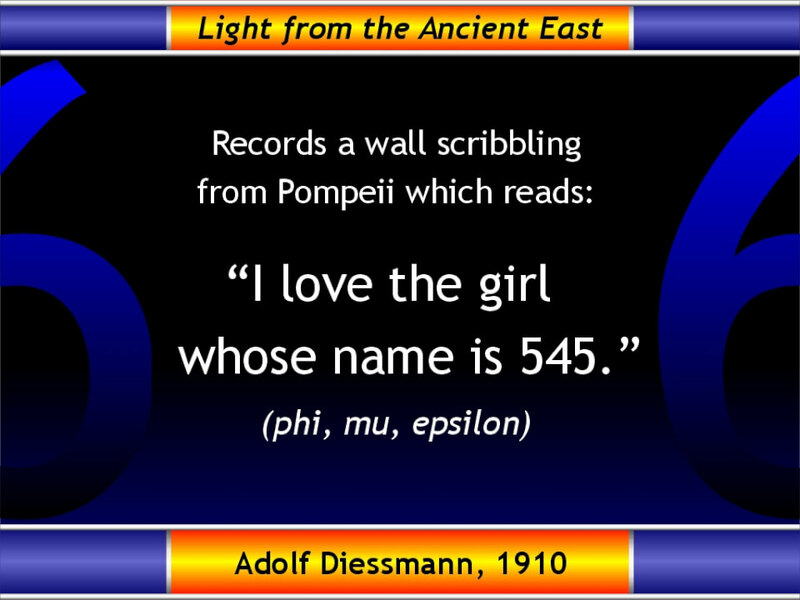 Here 545 is the "number of her name". If you can work out the particular combination of Greek letters which gives this value and also spells the girl's name, you've solved the riddle. This has long been the suggested method for solving the riddle of the beast's name also. It is not surprising then that letters in famous names of old were often totalled to find their sum. 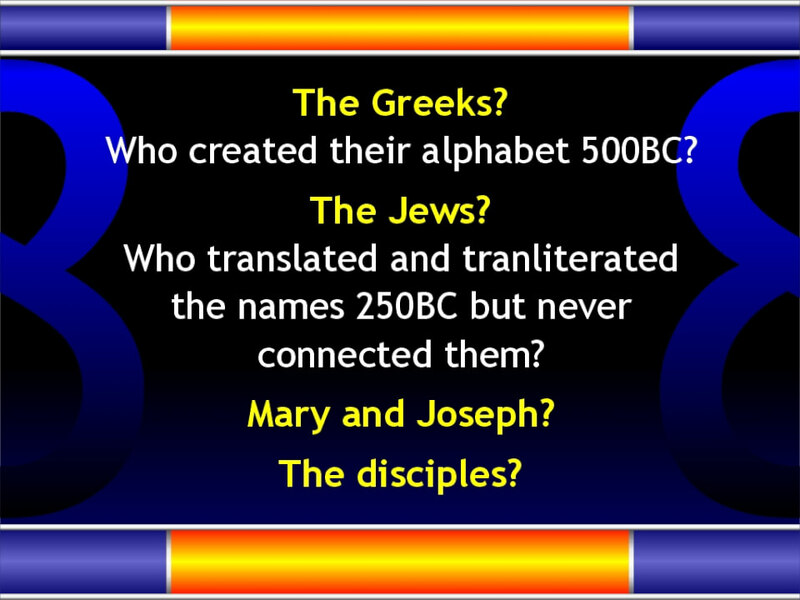 The name of Jesus was among them. 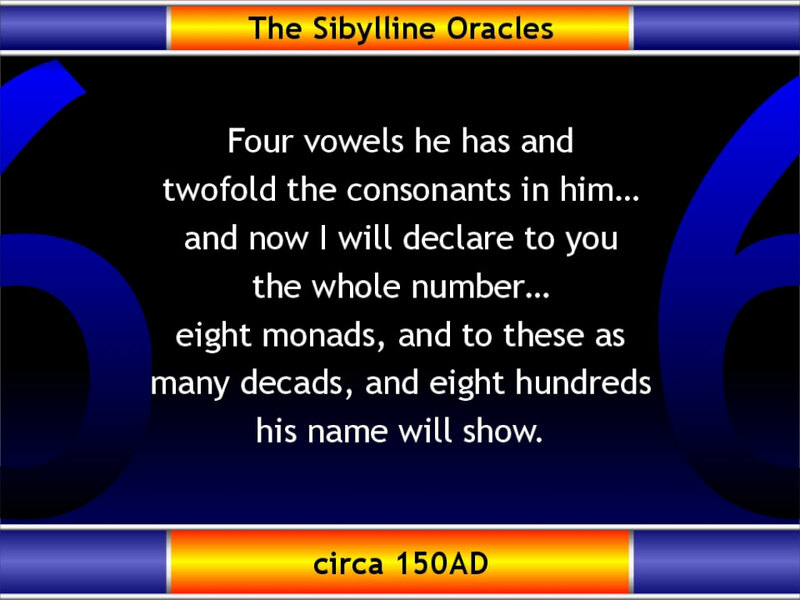 The famous and forged Sibylline Oracles, written in the second century, show that the “number of Jesus’ name” in the Greek was known even then. It had four Greek vowels, two consonants, with a total of eight units, eight tens, and eight hundreds. Here are the Greek letters in the name "Jesus" with their values and total. Now this is an interesting fact. And it is a very simple fact. The threefold figure of eight immediately makes us think of the similar pattern in the threefold figure of the beast, "666". One value belongs to the Christ, and the other to the antichrist. It does suggest that the riddle of the beast's name and number are to be solved in the same way. This is where the numbers and number patterns start coming in. Some concentration will be needed! Here we see both the name, Jesus, and the title, Christ, with their values together for the first time. Here we darken the title and concentrate first on the name Jesus at top. Many of the slides from this point on will have the features seen here. The label in the bottom left will reveal whether we are looking separately at Jesus, Christ, or Jesus Christ together. At the bottom right hand is a counter showing the total of the highlighted values we are looking at. In this case, we are looking at all the letters in the name Jesus. In this presentation we're going to leave aside the significance of the numbers for the moment and just focus on the patterns. Is the appearance and pattern of eight in the threefold 888 just a surface phenomenon, or are there other occurences at a deeper level? First thing to note is that the total of the name "Jesus" is a multiple of eight. It is also a multiple of 37 and 3. This in itself is not particularly remarkable. 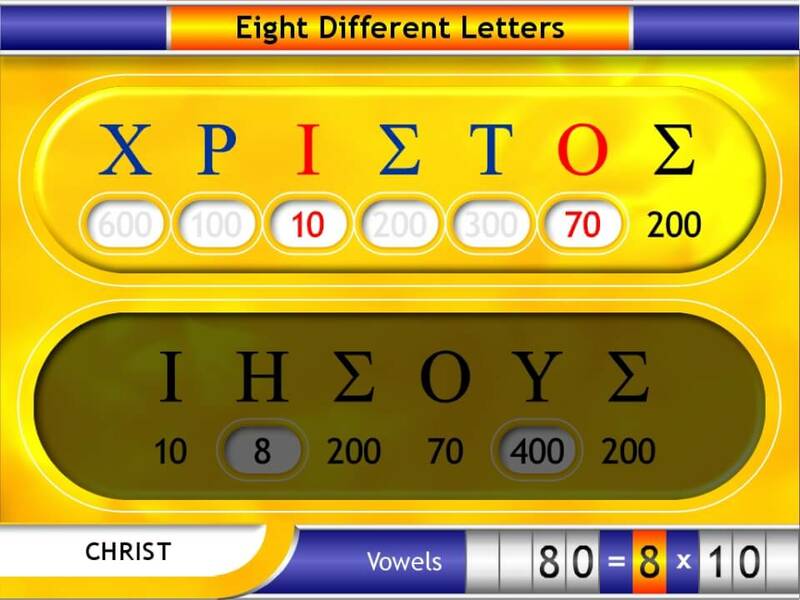 One in eight names or words in Greek will be found to be a multiple of eight. 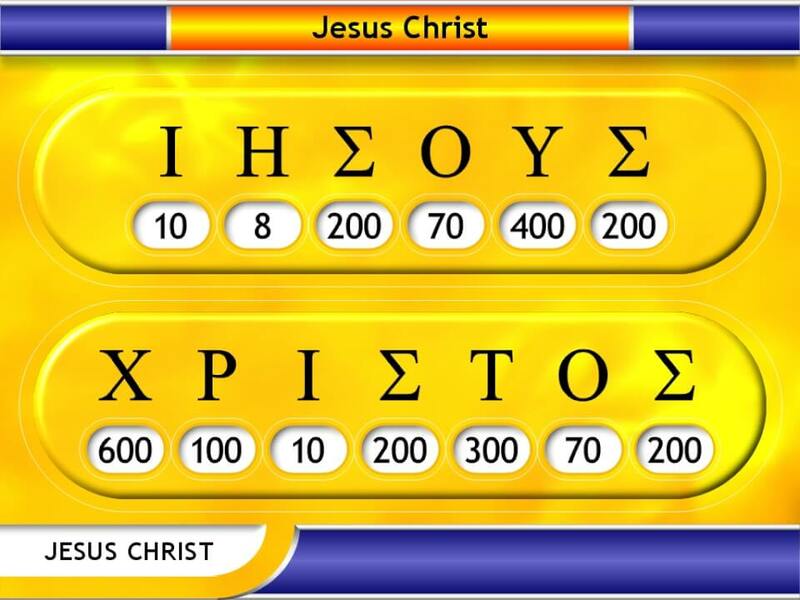 In this slide we focus on the title "Christ". Interestingly, this title also has a value which is a multiple of eight. Again, not remarkable in itself, and only slightly more so when viewed in combination with the name. The chance for two consecutively drawn random numbers to both be multiples of eight is one in eight multiplied by eight, or one in 64. How random these two name values might be is affected by the constraints of the Greek language and the assigned values of its letters and letter combinations. These things may make it more or less likely that Greek names and words have values which are multiples of eight (or other numbers). Again, though, a point of interest here is that both the name and title are multiples of eight and thirty-seven. This is a little less likely, given that the chance for two random numbers to both be multiples of eight and thirty-seven is one in 8 x 8 x 37 x 37, or one in 87,616. 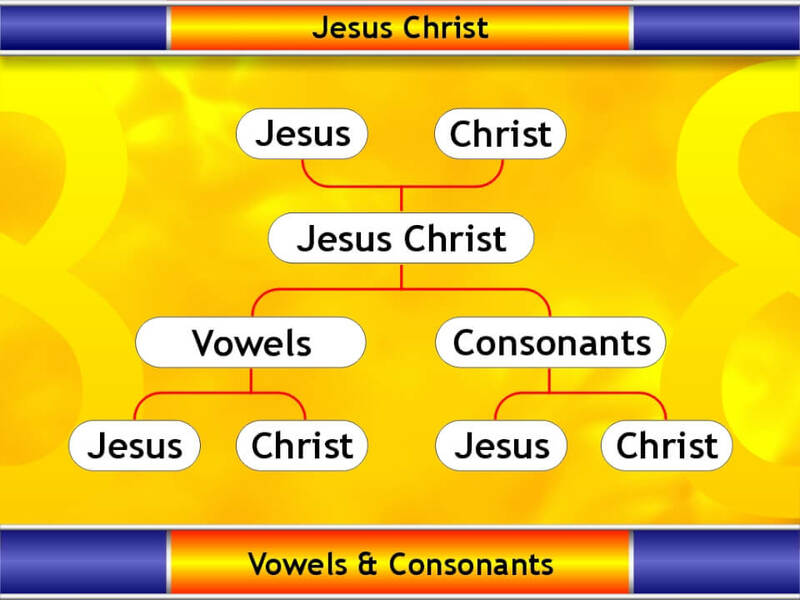 As we go through these slides it is worth bearing in mind that the word "Christ" is a title. It meant the "Messiah" or the "Anointed" one. 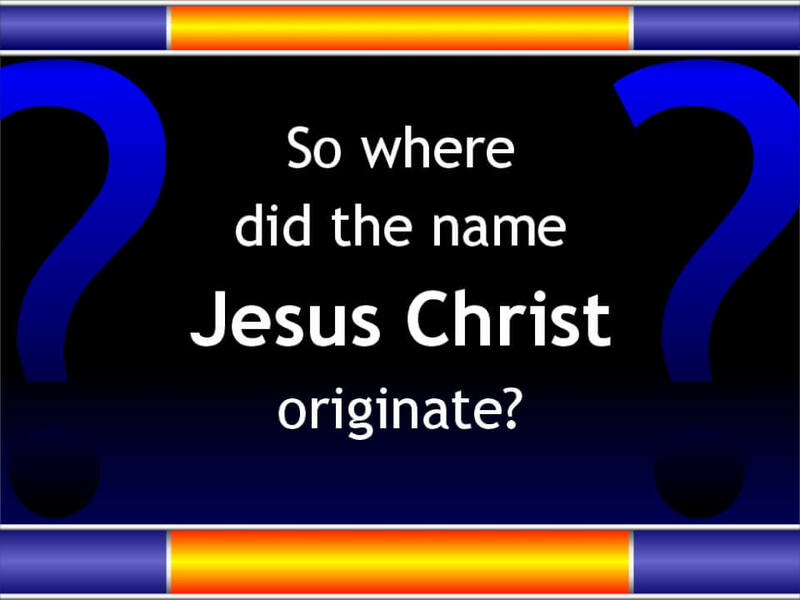 It is not the surname of Jesus, and existed long before he was born, in much the same way that "Queen" is a title, and existed long before "Elizabeth" was crowned. Now we see the total value of the name and title together. Obviously this is a multiple of eight and thirty-seven since both are individually so, but interestingly when both are united we have another instance of eight. The two together are a multiple of eight squared. 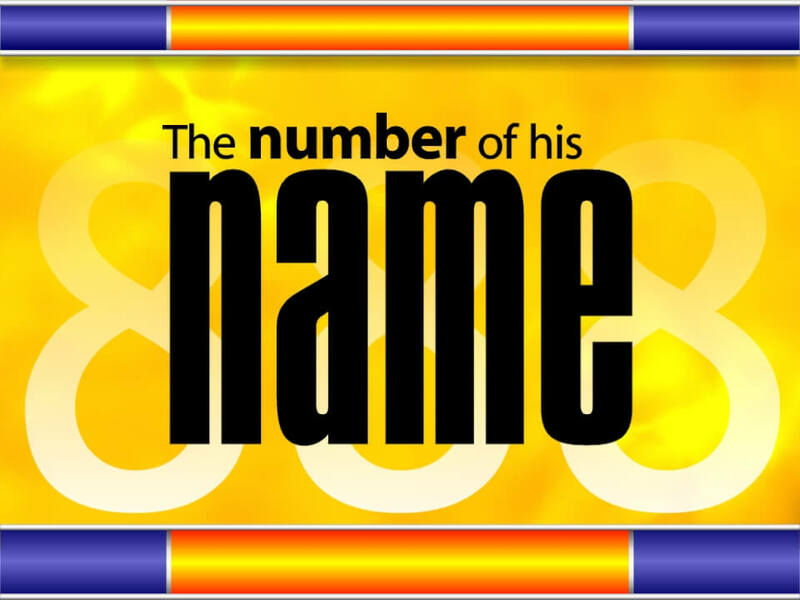 Is it significant that one of the most famous names in history totals the threefold figure of 888? (Especially in light of the 666 of antichrist?) And seems to share a pattern with one of the most famous titles in history? Possibly reinforcing that pattern by combination? Maybe. Maybe not. But the patterns of eight don't stop there, so we'll pursue it further. To begin, let's look at the vowels and consonants. Now, in the Greek alphabet, as in English, there are vowels and consonants. In English, the vowels are "a", "e", "i", "o", and "u" (and sometimes "y"). In these slides we will highlight the Greek vowels in red. These are the vowels in the combined name and title. We will highlight the Greek consonants in blue. These are the consonants in the combined name and title. Now, let’s concentrate on the vowels first. Note that we are looking only at the values highlighted in white. Throughout the presentation we will use this method to show which values are being looked at. The value of all the vowels is a multiple of eight. Now we switch to the consonants. The value of all the consonants is a multiple of eight. This is automatic, since we knew the total of all letters was a multiple of eight, and we have just shown that the vowels are a multiple of eight. The consonants therefore had to be a multiple of eight as well. 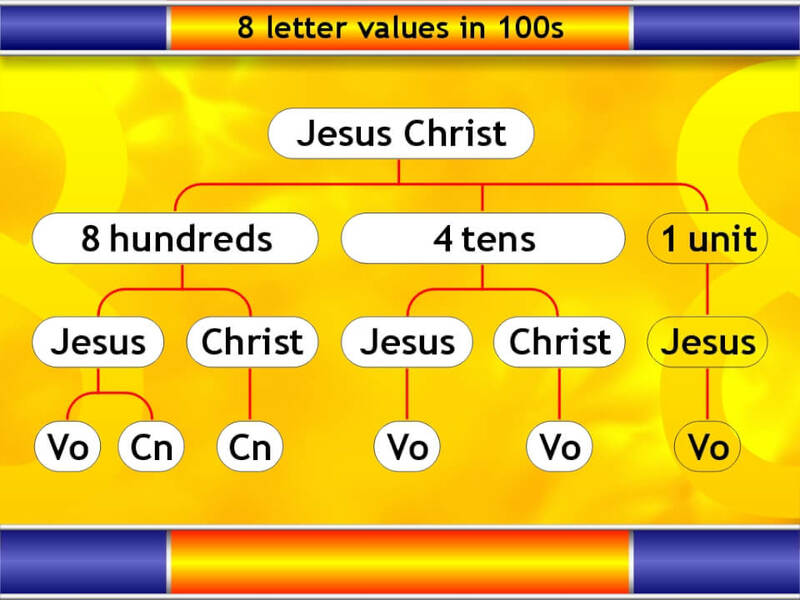 We've looked at the total vowel and consonant values in the combined name and title. What happens if we look at the totals in the name and title seperately? Here we see that the total value of the vowels in the name alone are also a multiple of eight. This means that the total values of the vowels in the title must also be a multiple of eight. We saw the total value for the consonants in the whole name and title was a multiple of eight. But if we look at the consonants in the name only, the total is still a multiple of eight. And this means the total value of consonants in the title only must also be a multiple of eight. Before going further, let's just recap some of what we've seen. The total value of Jesus is 888. 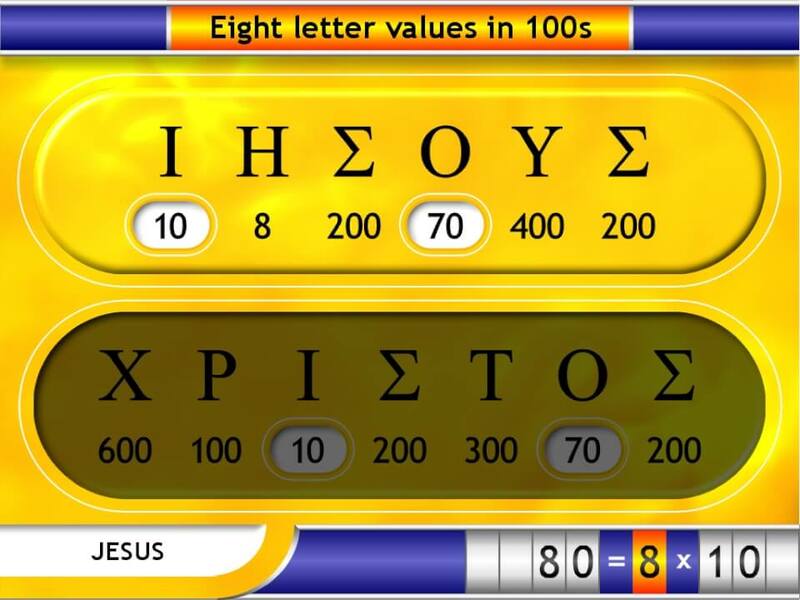 Both the total values of the name, Jesus, and the title, Christ, are multiples of eight (in fact, both are multiples of 8 x 37). When combined, the value of Jesus Christ is not only a multiple of eight (which is to be expected) but of eight squared. 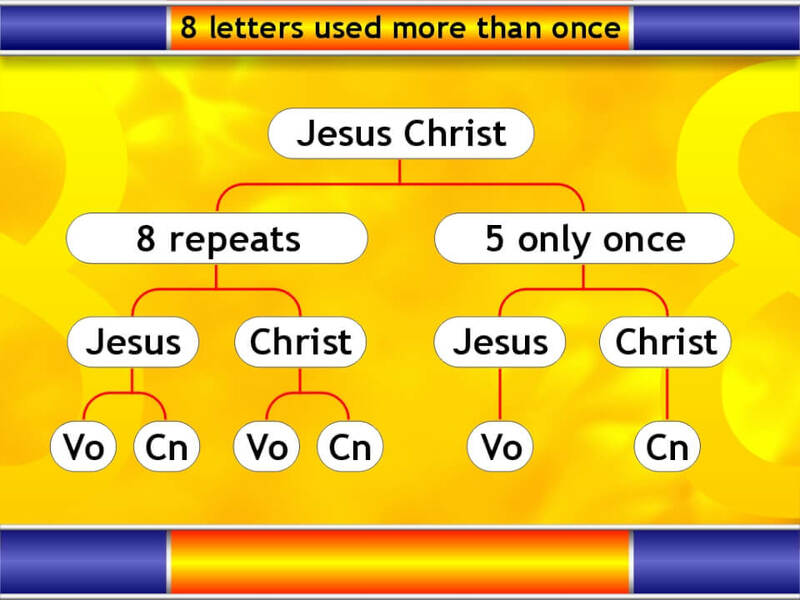 The value of the vowels in Jesus Christ is a multiple of eight, and therefore the value of the consonants in Jesus Christ is also a multiple of eight. 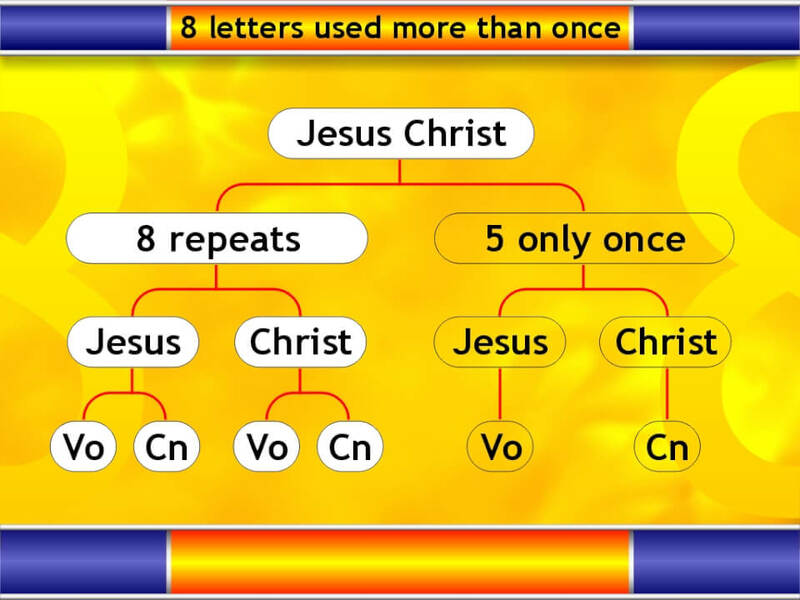 When broken down into the name and title separately, the value of vowels and consonants in each is still a multiple of eight. Are there further patterns of eight to be found? Up until this point the numeric patterns we've looked at were noted over a hundred years ago by a man named Ivan Panin. He published these particular facts in the notes of his "Numeric English New Testament" in 1914. 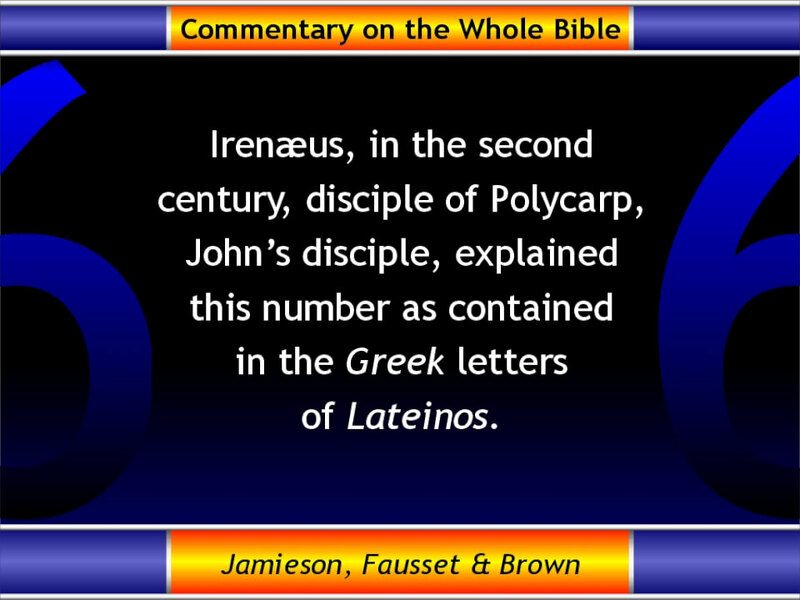 This was a translation of the New Testament from the Greek which he claimed was confirmed by such patterns running through the original Greek text. 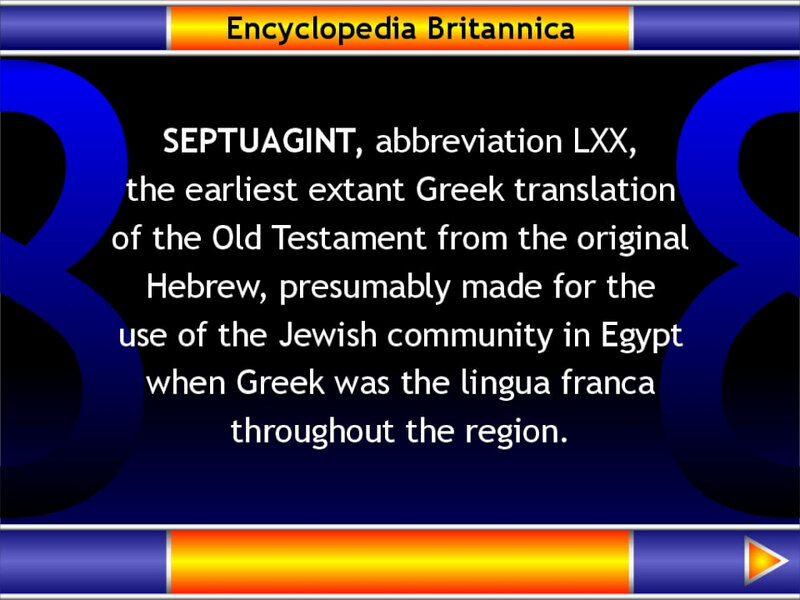 He also claimed and published similar patterns running through the Hebrew text of the Old Testament. Some of his published findings are very interesting. The true significance of much of what he published is beyond my mathematical ability to evaluate. Some of his findings, particularly concerning the probability of such patterns, are certainly overstated. Nevertheless, this small example seems to be an easier one to examine. From this point on in the slides, the similar patterns noted are those I've found myself. I leave it to others to determine if any or all of these patterns constitute evidence of design, or if they can be demonstrated to be the sorts of random occurrences that can be found anywhere. The question is not so much whether such patterns can be designed, but whether they are likely to have been designed, from a probability point of view. If they are, it opens up a number of further questions, some of which are discussed towards the end of this presentation. If you're a genuine maths whiz who can shed some light on the real probabilities of this particular example, I'd be happy to hear from you. You can contact me on the General Enquiries form under Contact. 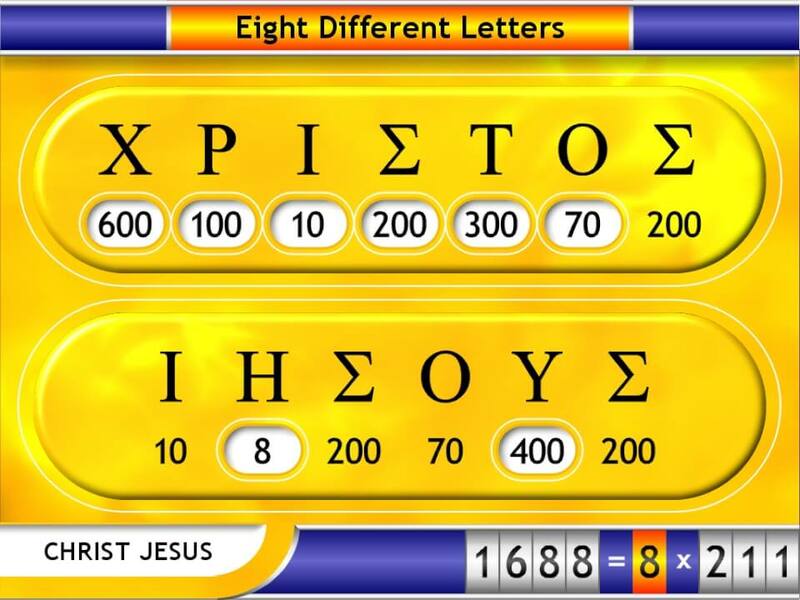 First, Jesus Christ is made up of eight different Greek letters. 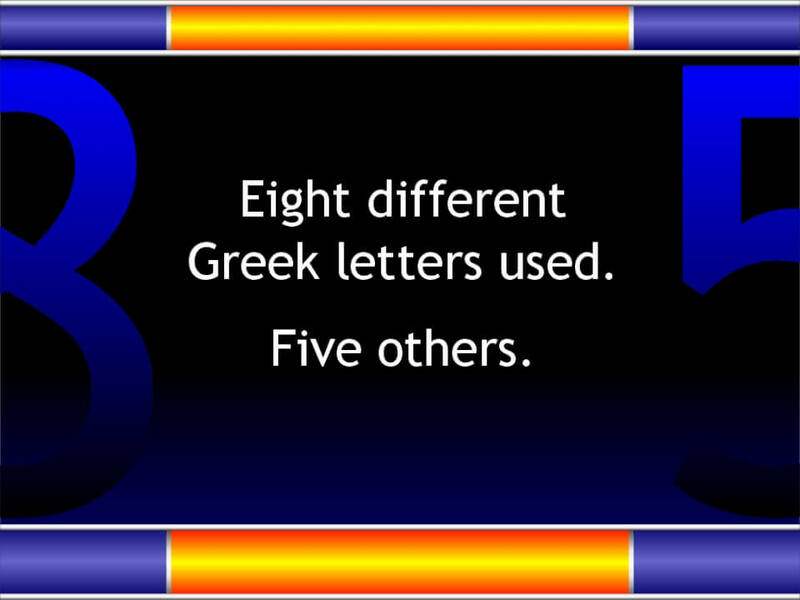 Second, eight letters appear more than once (or to look at it from the other way, five letters appear only once, leaving eight others — those eight comprise two letters appearing twice, and one four times). Third, there are eight letters with values in the hundreds, four in the tens, and one with a value in units. The important point to keep in mind here is that all of these groupings are different. Each set produces a different group of values in different arrangements. Let's look at the first of these three sets. Jesus Christ uses eight different letters from the Greek alphabet. The other five are duplicates of these letters. Here are the eight different Greek letters highlighted in order of their first appearance in the name and title. 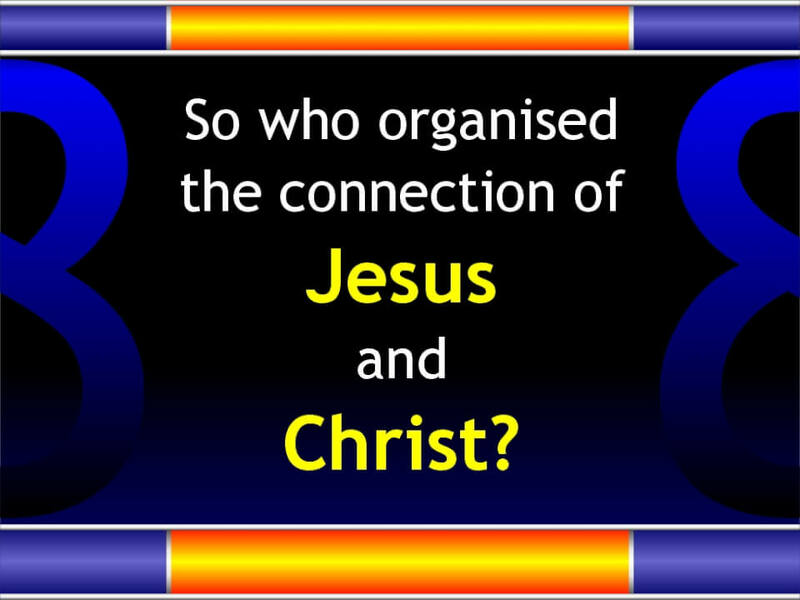 Since Jesus Christ is sometimes referred to in scripture as Christ Jesus we will later see a second arrangement under the same heading. 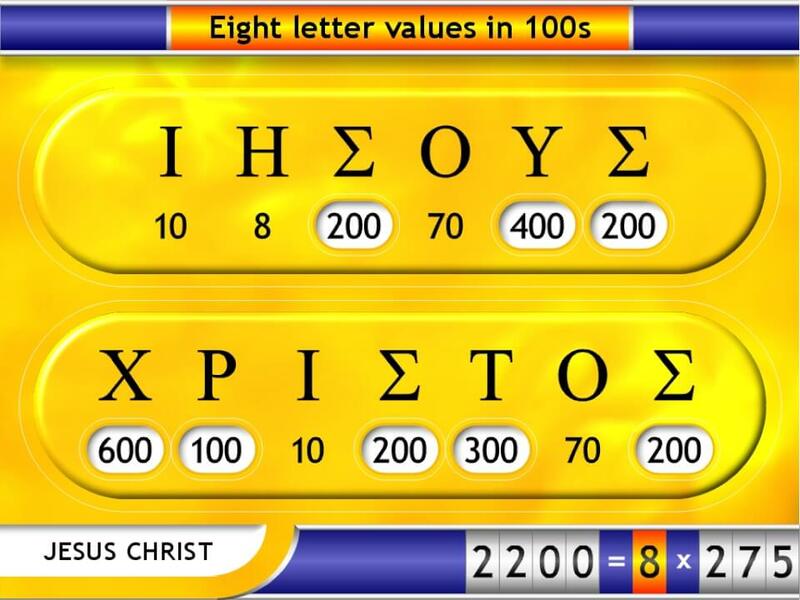 The first point to note is that the eight different Greek letters have a combined value that is a multiple of eight. 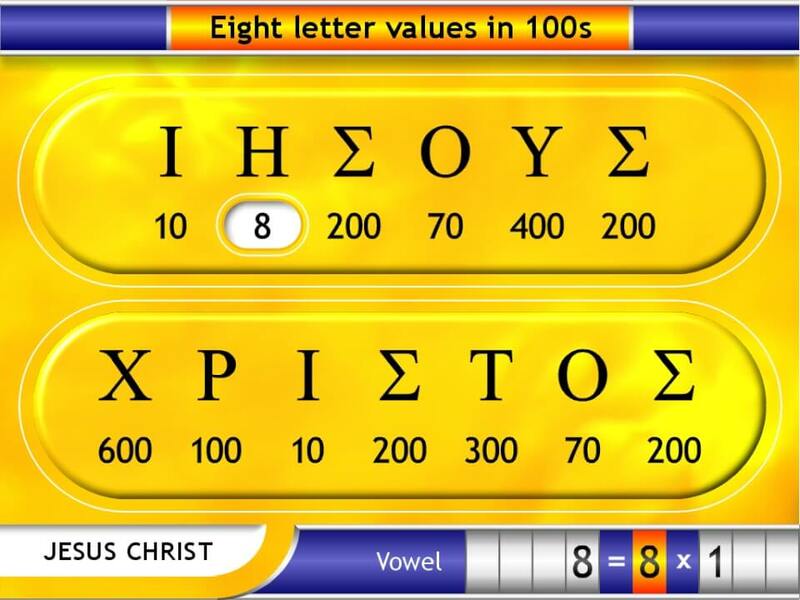 When we look only at those letters that appear in the name, we see they also have a value that is a multiple of eight. 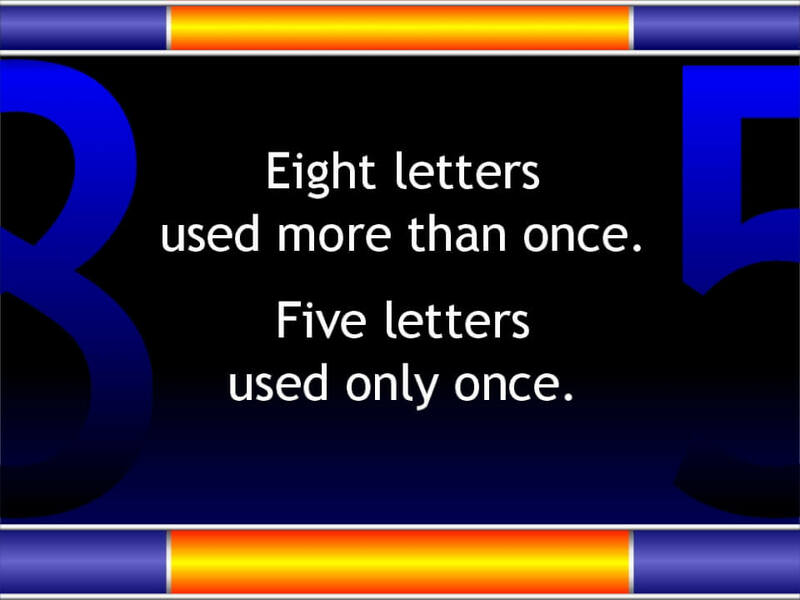 This means that the remaining different letters in the title are also a multiple of eight. As we will with all these patterns, let's break the values down into vowels and consonants (red for vowels, blue for consonants). The vowels in the name are a multiple of eight. Therefore the one consonant is also a multiple of eight. 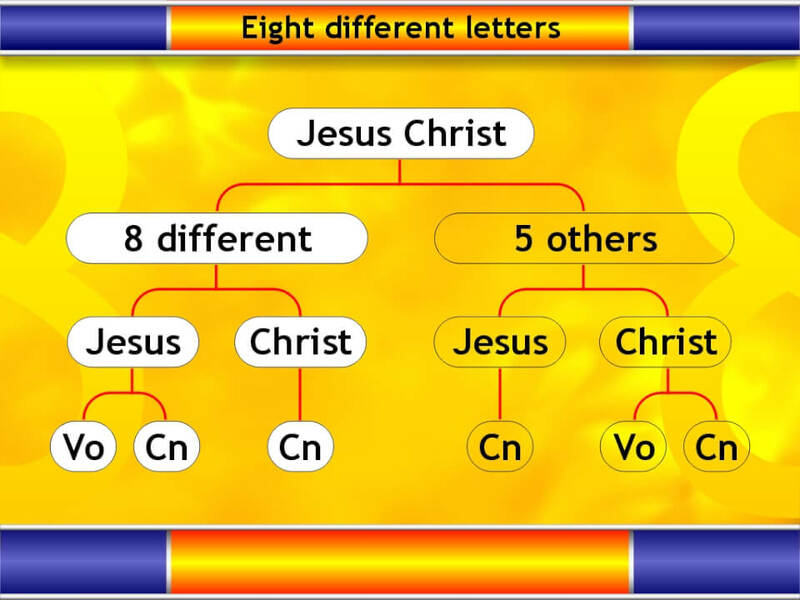 All of the different letters we are looking at in the title Christ are consonants, so as already seen, their combined value is a multiple of eight. It's easy to get lost in these sets of numbers, so I'll show a chart now and again to explain what we've looked at and where we're going next. 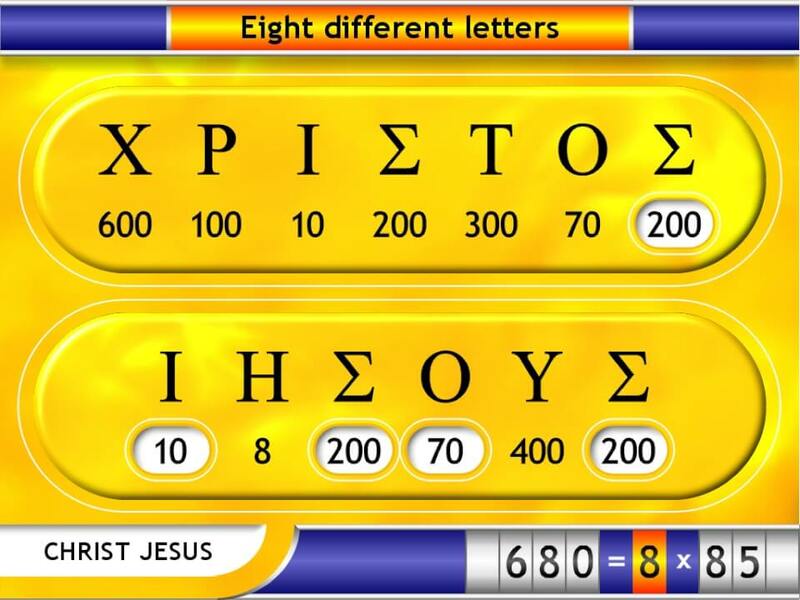 We've just seen the values of the eight different letters in the name and title Jesus Christ. The breakdown is shown on the left. Each white ballon represents a set of letters with a combined value that is a multiple of eight: the eight letters combined, then divided between the name and title, then divided further into vowels and consonants. This is the same breakdown we will see with all the patterns we will look at. Now we will look at the branch on the right, the five other letters in the name and title. As you can already see, the breakdown is similarly into sets with combined values that are multiples of eight. It's important to realise that while all of these sets of numbers (the "balloons") represent values that are multiples of eight, not all represent independent "features" of eight. For example, if we know that the combined value of the letters in Jesus Christ is a multiple of eight, and eight of those letters (the eight different letters) total a multiple of eight, then the remainder (the five others) must also be a multiple of eight. The last feature of eight is automatic, and no surprise. We should keep this in mind when trying to understand the relationships and patterns between and in all these sets and subsets. So again, we've just seen these eight different Greek letters in Jesus Christ. Now we're going to look at the others. And here they are. These are the five other letters which are simply duplicates of the eight different Greek letters. 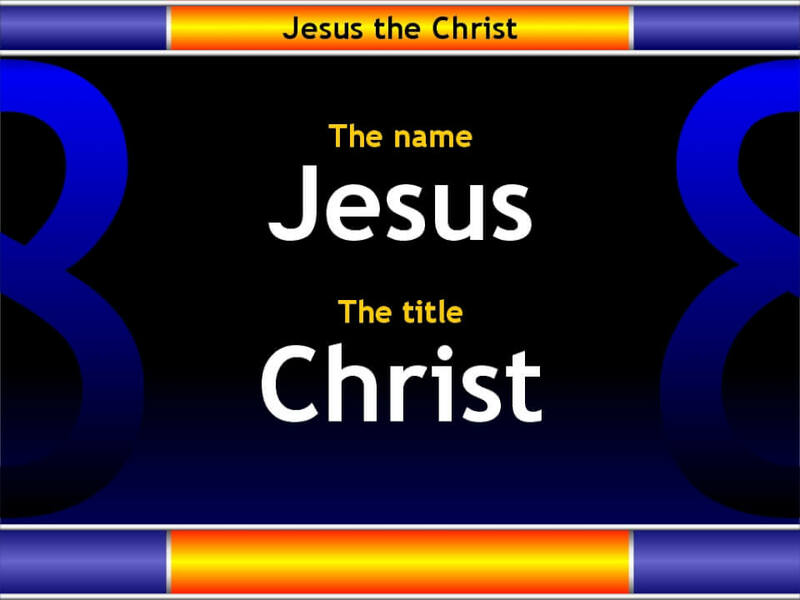 When we break these down into the name and title, only one occurs in Jesus. This one letter is a consonant, and a multiple of eight. 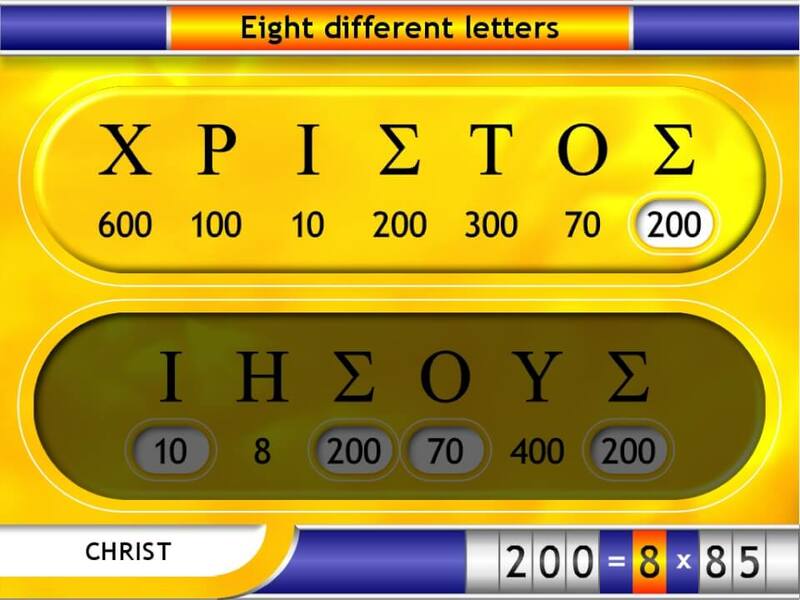 The other four letters appear in Christ (again, in order of their appearance). They total a multiple of eight. Of these two are vowels and two are consonants. The vowels total a multiple of eight. And the consonants total a multiple of eight. 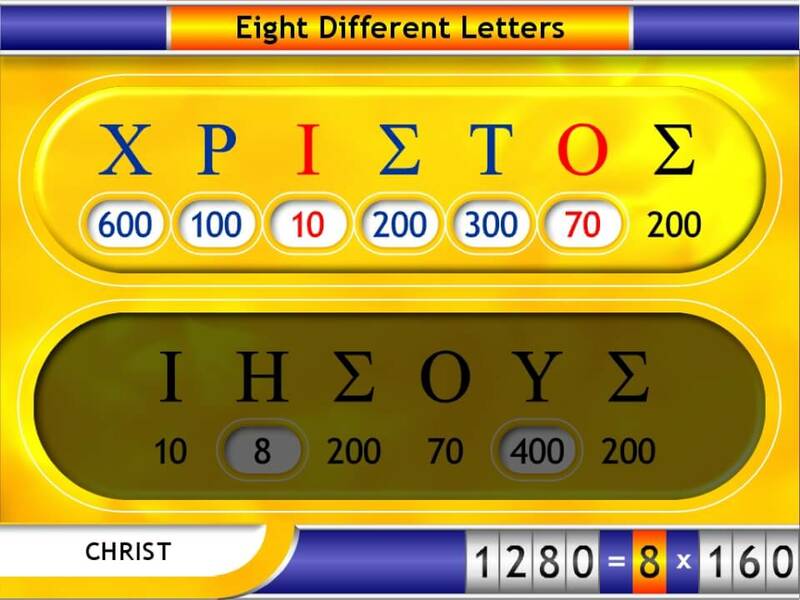 In the previous slides we highlighted the eight different Greek letters according to the order of their first appearance in the name Jesus Christ. But while "Jesus Christ" is the normal order of the name and title, sometimes the title is put before the name in the Greek; i.e., as "Christ Jesus". 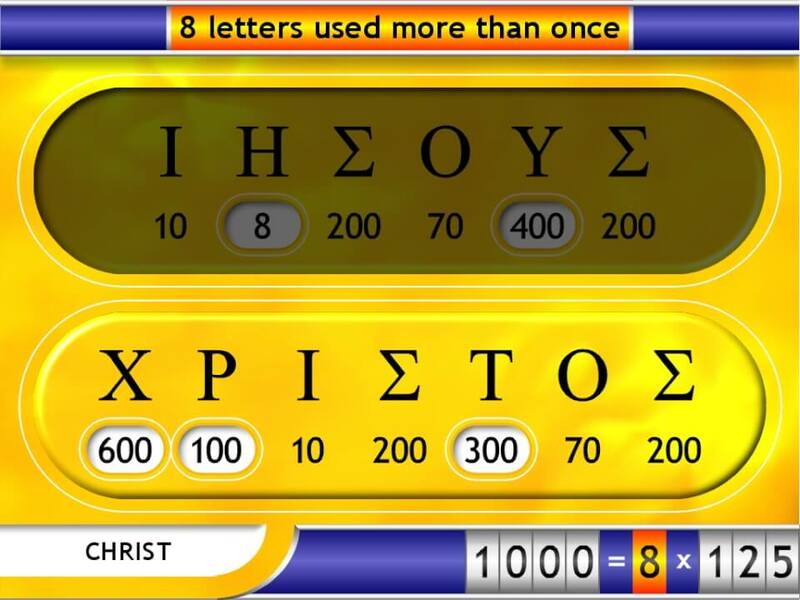 What would happen if we used the reversed name and title and again highlighted the eight different Greek letters according to the order of their first appearance? The new arrangement, starting with the first letter in Christ. 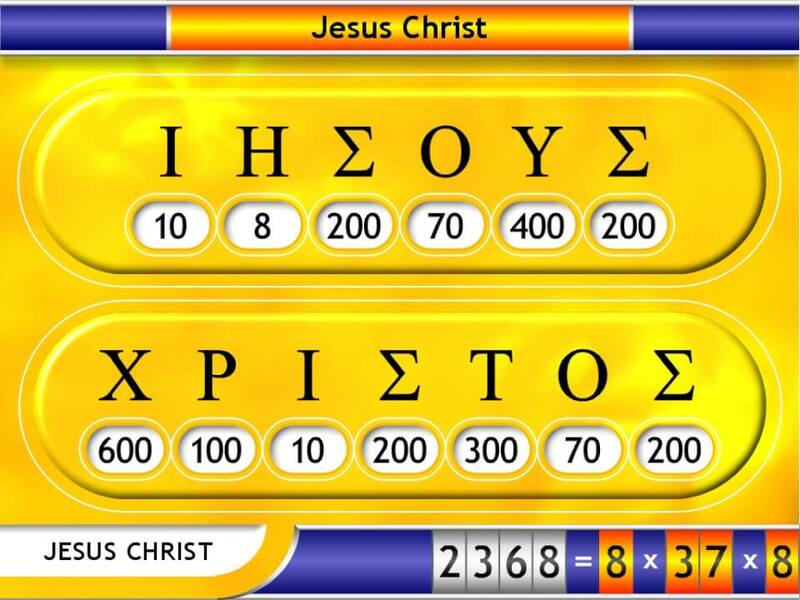 Note the indicator in the bottom left corner now reads “Christ Jesus”. The Greek title now appears at the top of the slide. Same letters, same total, different arrangement. 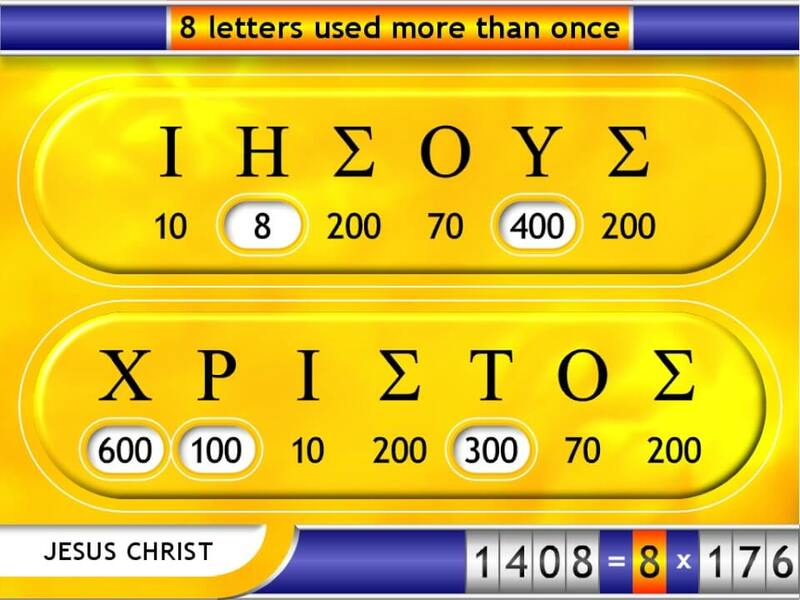 Most of the different Greek letters are now first encountered in the title, Christ. First, let's look at the letters appearing in Christ. This set also totals a multiple of eight. Two are vowels (red), four are consonants (blue). The vowels are a multiple of eight. The consonants are a multiple of eight. The letters appearing in Jesus are a multiple of eight. Again, as just seen, the eight different letters appearing in the reversed "Christ Jesus" break down into sets of multiples of eight. Now we see in the next slides that the familiar breakdown applies to the other remaining letter sets as well. These are then the remaining five letters, duplicates of the eight different letters. The one that appears in the title is a multiple of eight. The four in Jesus total a multiple of eight. Of which two are vowels and two are consonants. So we have looked at the first of three other ways of dividing the letters. In fact this first way gave us two different sets of values to look at: one under the arrangement "Jesus Christ" and the other under the arrangement "Christ Jesus". Now there are at least two other ways of dividing the Greek letters into sets. To avoid this becoming overly tedious I will simply show the breakdown charts in the next few slides. I do however include all the individual slides afterwards for those who want to double-check the figures. First off, there are eight letters that have appeared more than once in the name and title (or looked at the other way, five letters that are used only once). This again gives us a different set of values to look at. The chart shown here gives a quick overview to show that the totals of these letters are multiples of eight whether viewed in the name and title together, or seperately, or as vowels and consonants. Remember, these are different groupings of the letters from what we have seen previously. The breakdown is familiar. 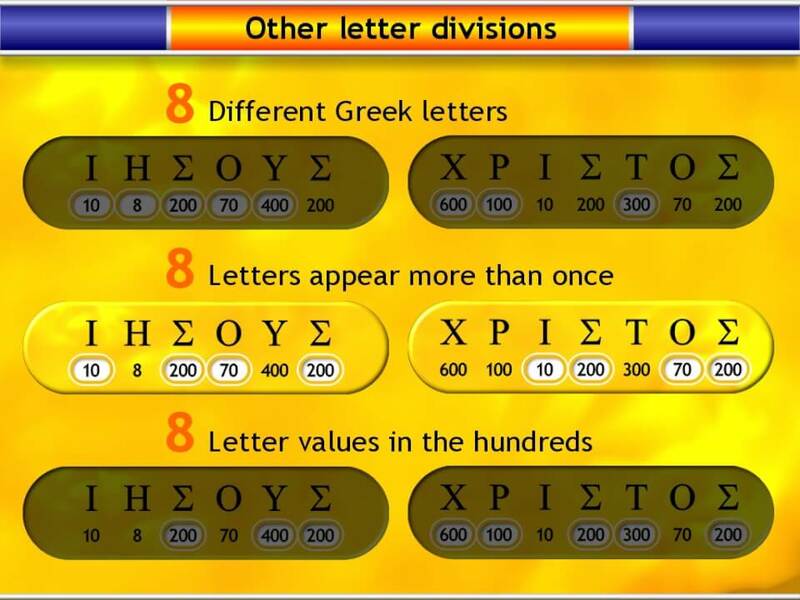 Another way of dividing the Greek letters into groups is to consider whether their values are in the hundreds, tens, or units. 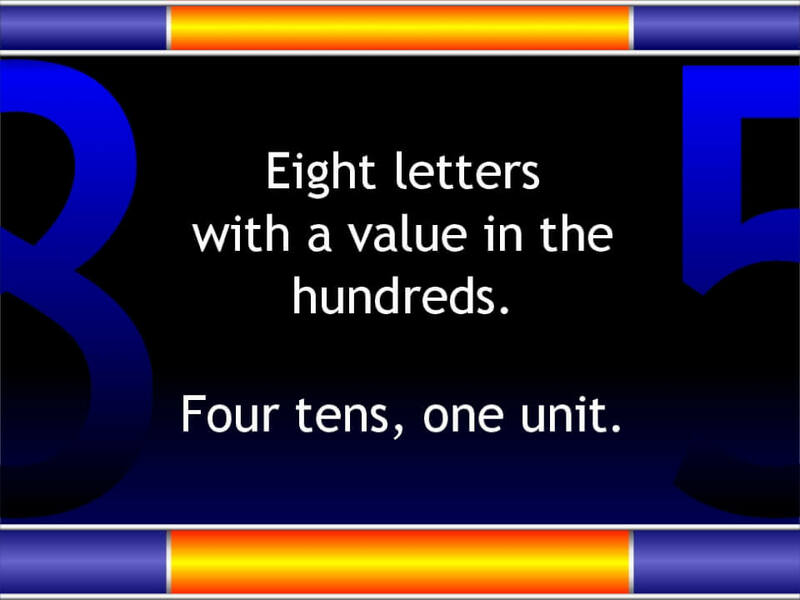 There are eight letter values in the hundreds, four in the tens, and one in units (fortunately an eight, or most of these patterns would simply disappear). Again, as a quick overview, the familiar breakdown. Each white balloon representing a different set of letters with a total value that is a multiple of eight. For those who wish to check all the numbers in the two flowcharts just shown, the following slides go through them as before. You may wish to skip quickly through them otherwise (approximately 35 slides). 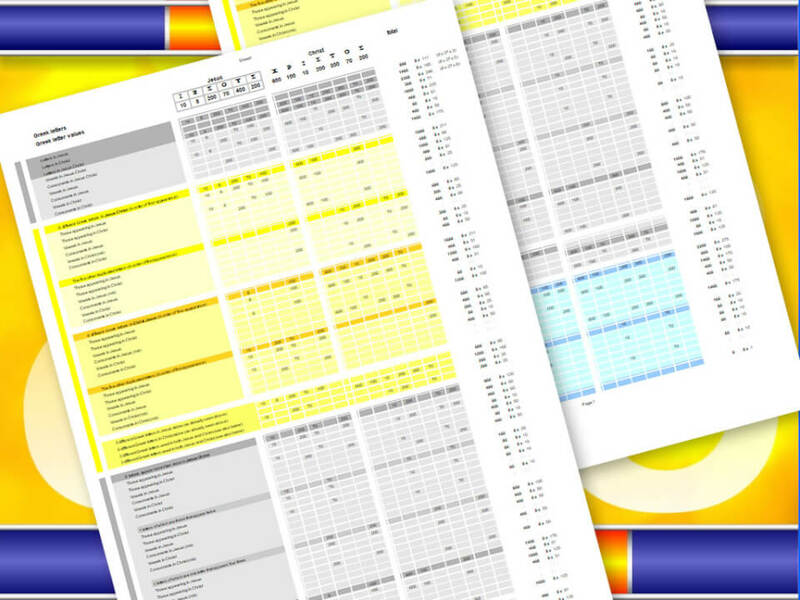 There will be a final slide and document which shows all groupings and totals at the end. First, the eight repeated letters. They total a multiple of eight. 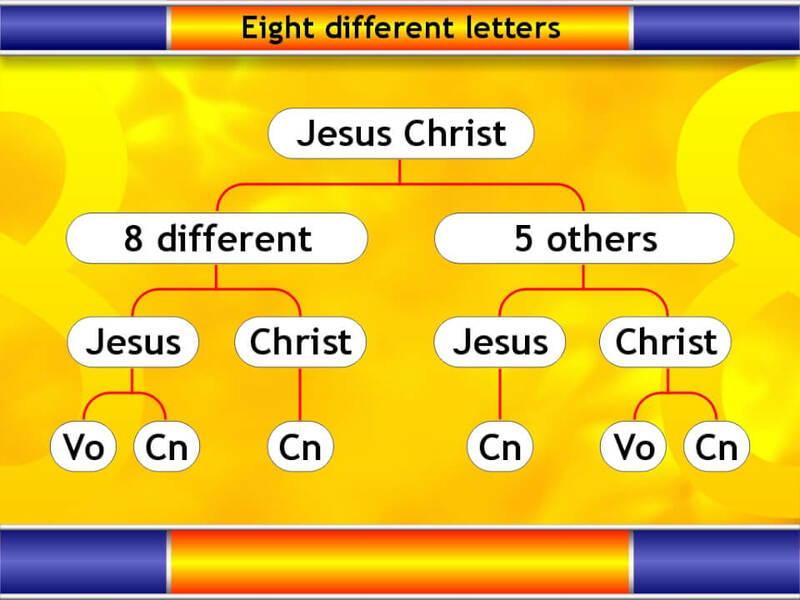 Those in Jesus are a multiple of eight. Two vowels and two consonants. The total of the vowels. The total of the consonants. 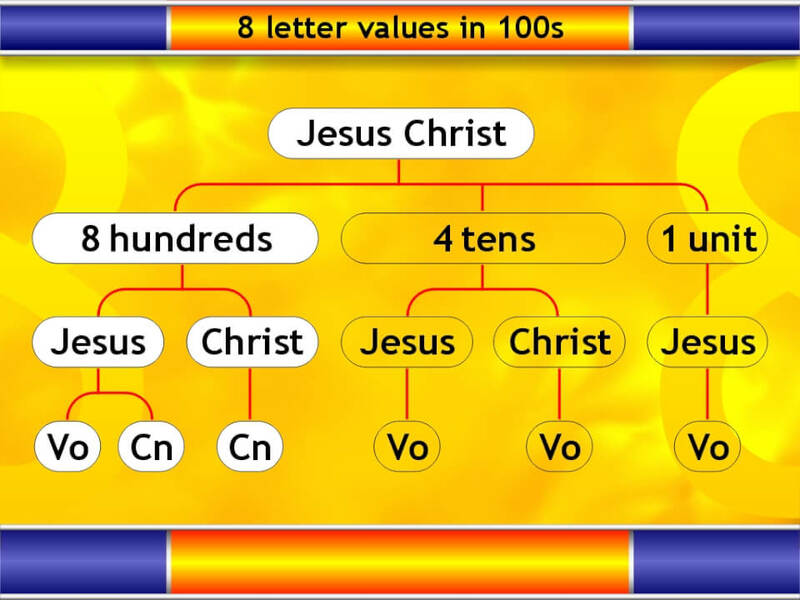 The total of the letters in Christ. Now we look at the right-hand branch — the five letters used only once. The five Greek letters used only once in Jesus Christ. The third way of dividing the letters is among the letter values themselves – into those with values of hundreds, tens, and units (under which groupings all individual letters of the Greek alphabet fall). First we look at the letters with values in the hundreds. They are a multiple of eight. 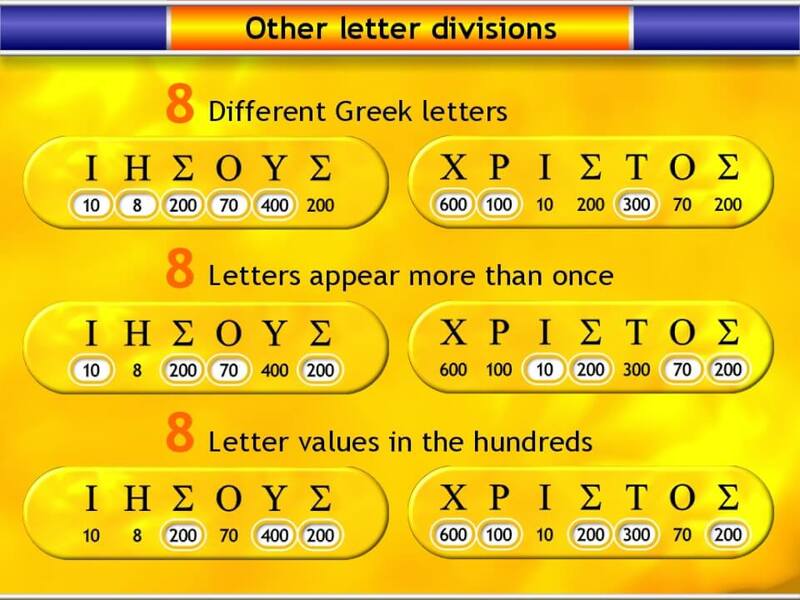 While the groupings according to letter values may be more likely to be multiples of eight than some of the other divisions we've seen, it's still not automatic that a number that is divisible by eight is necessarily divisible by eight in its hundreds, tens, and units. For example 888 is clearly going to be divisible by eight in its hundreds (800), tens (80), and units (8), but in a number like 736 (8 x 92), 700, 30, and six are not individually divisible by eight. Those letters appearing in Jesus total a multiple of eight. Divided into vowels and consonants. Those letters appearing in Christ total a multiple of eight. 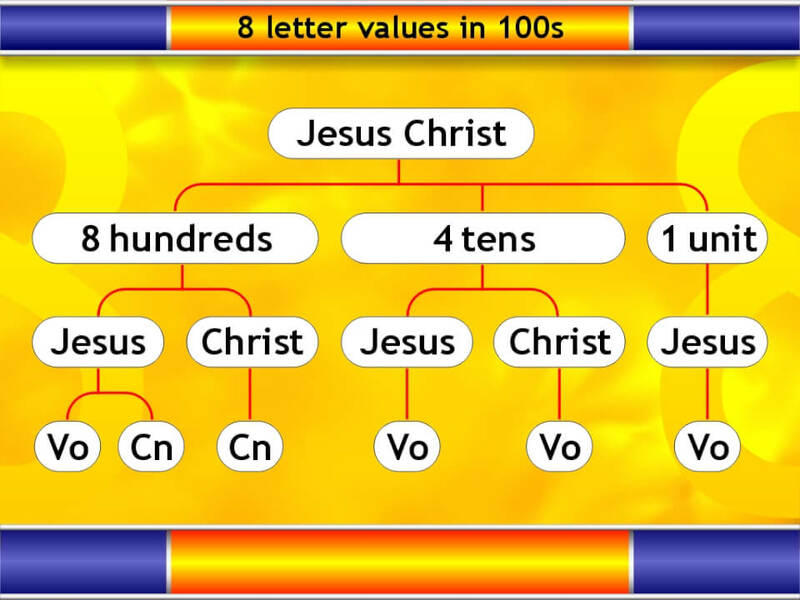 Next we look at the letters with values in the tens. These total a multiple of eight. Those in Jesus total a multiple of eight. 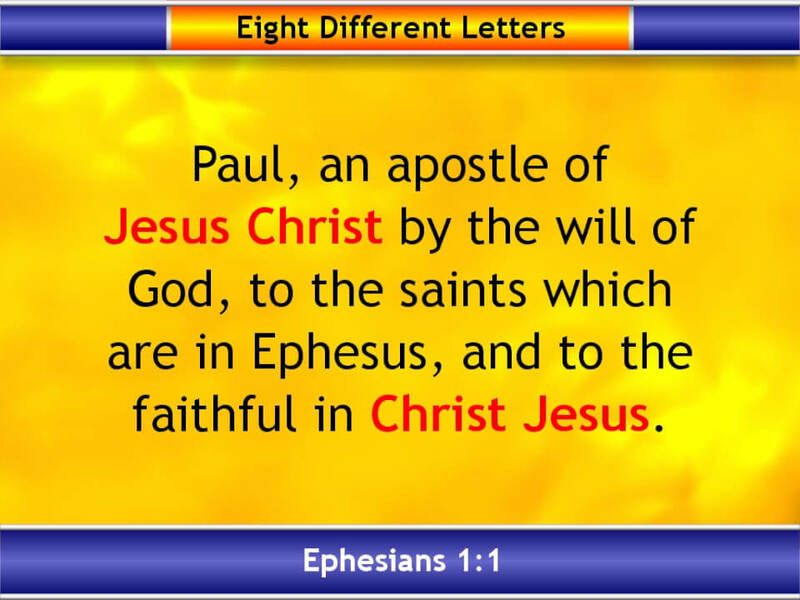 Those which appear in Christ total a multiple of eight. There is one letter with a value in units. It appears in Jesus, and is a vowel. Again, while all the white balloons identify a set or grouping with a total value of eight, they do not all represent independent or new features of eight. The one letter with a unit value, which is a vowel. So there we are. There appear to be a number of consistent patterns of eight running through the Greek letter values of the name and title Jesus Christ. Are the patterns perceived or real? The facts are certainly real, the multiples of eight are certainly real, and easy to check, but do they represent cherry-picked patterns out of randomness, evidence of design, or "sheer dumb luck"? If the patterns are random, it should be easy enough to find similar consistent and seemingly pervasive patterns in other names. (Maybe someone could try something similar wih English names and surnames. Assign similar values to the English alphabet, beginning with units, then tens, then hundreds, write some computer code, and have a go!) Again though, the question is whether probability suggests design here is more likely than chance. Is it purely a coincidence that the name Jesus in Greek totals 888, and the antichrist in the Bible is given the number 666? If the patterns examined are unlikely to be the result of random causes, and rather evidence of design, it raises a couple of questions. First, where did the name and title originate? As noted, Jesus is a name. Christ is a title. 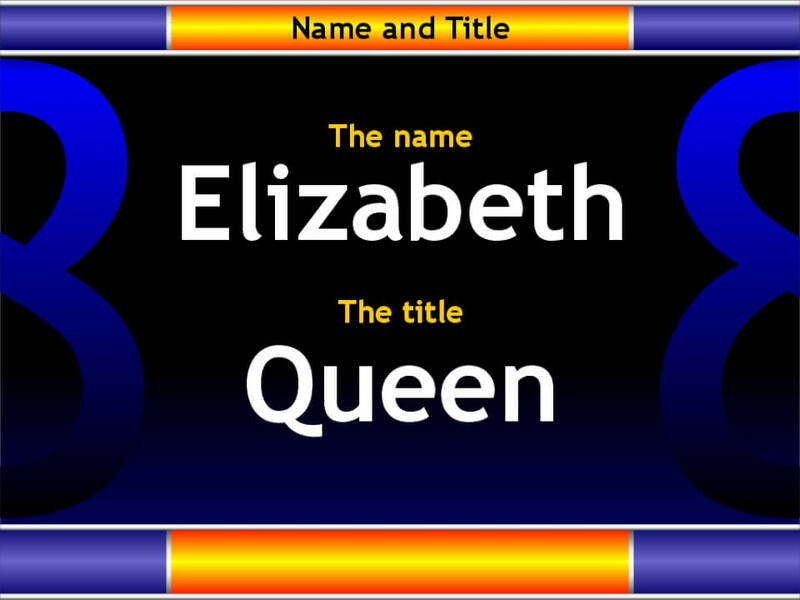 In a similar manner, "Elizabeth" is the name and "Queen" is the title of Queen Elizabeth II. The name Jesus is actually the Greek form of the Hebrew "Joshua" or "Jeshua". 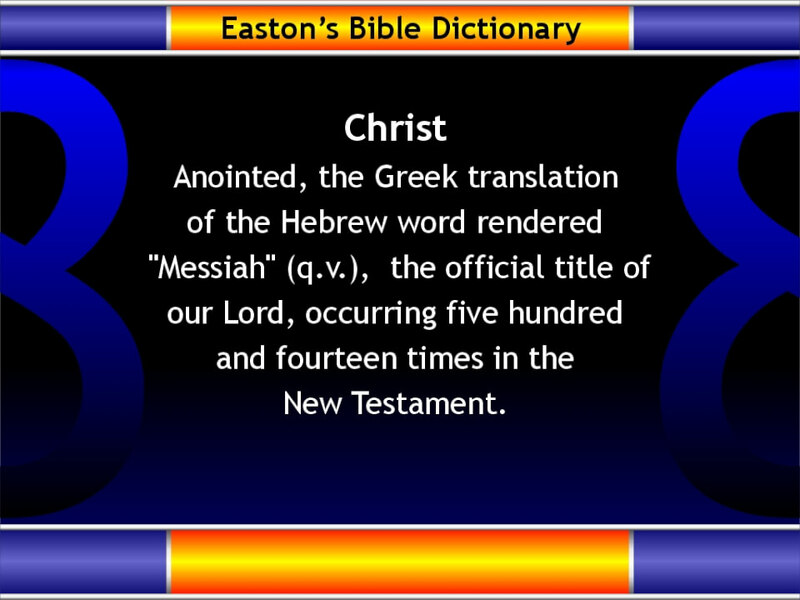 Christ is a title and means "Anointed" or "Messiah". 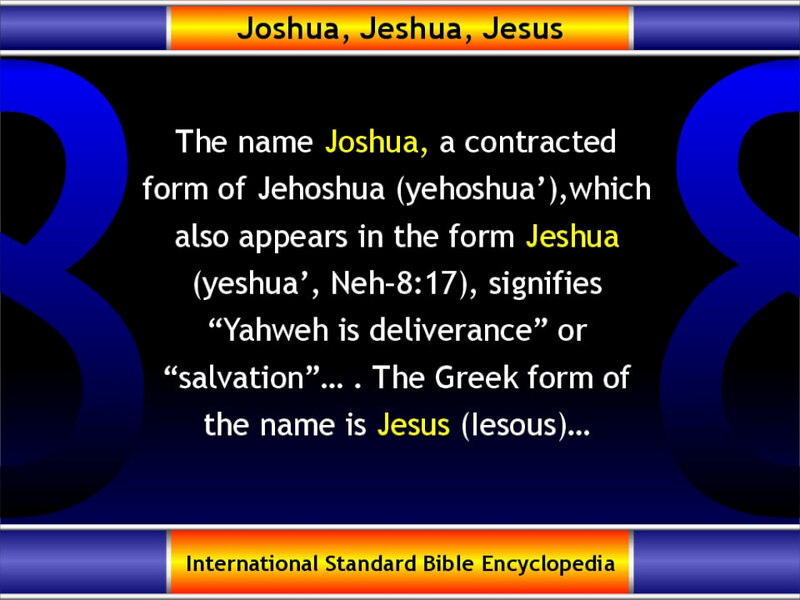 The common Hebrew name Joshua was transcribed into the Greek form Jesus long before Jesus was born, when the Hebrew Old Testament was translated into Greek. This took place in at least the 2nd or 3rd century BC. The numeric values and letters of the name and title were established long before the time of Jesus. Did someone intend them to be put together? 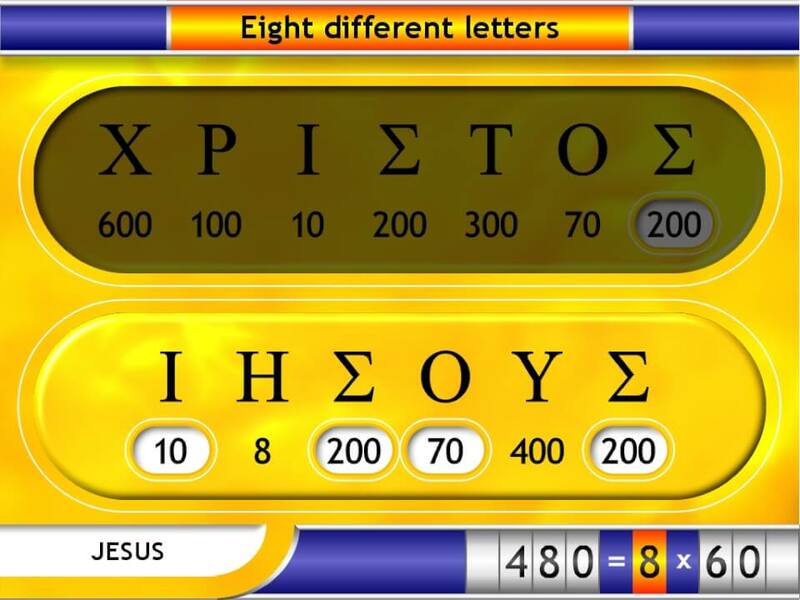 If probability does demonstrate design in the connection of Jesus and Christ, any later attempts to connect the two (such as by the disciples) were restricted by values and spellings already present. This would be the equivalent of us today first assigning similar values to the English alphabet, and then attempting to find both a pre-existing first name and surname that exhibited similar patterns when combined. Any earlier attempts to connect the name "Jesus" and the title "Christ" would have involved an expectation that the Messiah's name would be "Joshua" or "Jesus". Did the Jews expect this? The biblical record is that Jesus' name was given him by God, and announced by the angel sent to Mary. And if there is evidence of design in that name, that deserves a second thought. If you want to see these patterns and values in more of a one-page, condensed form, click on the slide to download a simple PDF spreadsheet for easier reference. If you're a genuine maths whiz who can shed some light on the likely probabilities of these patterns, we'd be interested in your input. Contact us on the Contacts/General Enquiries page.